The Euro crisis is stretching for such a long period of time that it is difficult to know what is news and what is not. Yields go up and then they go down. The ECB is buying bonds or maybe they are not. Financial markets are an effective discipline on profligate individuals and states because markets cannot easily be bullied or lobbied, and their threat to make the cost of funds prohibitive is effective. 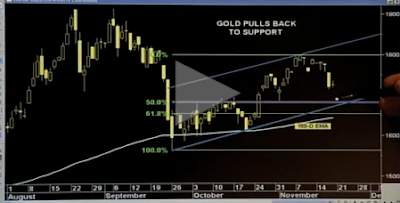 Financial markets are NOT effective when it comes to providing discipline to governments. Yes, occassionally they do bring governments down and they push governments that misbehave towards default, but they do so in the last minute. They are completely absent in the years where discipline could really matter, when things go well and governments should work hard at generating a large surplus. This is the experience of European countries since the launch of the Euro when all governments were seen as identical and their bonds were priced as risk-free assets. Where was the discipline of financial markets then? There is a story in the movie "The Inside Job" about a paper that Fred Mishkin (a Professor at Columbia University and former member of the Board of Governors of the US Federal Reserve) had written on the Icelandic banking system before the crisis. The original title of the paper was "Financial Stability in Iceland" but the paper appeared in his CV as "Financial Instability in Iceland" after the crisis had taken place (and after the movie was released the title was changed back to the original one -- here is a clip of the interview). This clip made me think of the European Stability and Growth Pact that seems to be delivering exactly the opposite of what the name of the title suggests: Instability and lack of growth. European countries agreed to limit their government deficits and government debt (to 3% and 60% respectively) as part of the Maastricht Treaty that led to the creation of the Euro. The limits were not strictly enforced when the membership decision was made. Some countries (Belgium or Italy) were allowed to be members of EMU with debt levels that were double the established limit (the way this worked was through a loose interpretation of a footnote in the Treaty that allowed countries to be accepted even if their debt was above 60% if the level was close to 60% and there was enough progress in the prior years -- how is 120% close to 60%???). The constraints on fiscal policy were made more explicit through the Stability and Growth Pact that took the numerical limits one step further and developed a set of more specific interpretations of the limits as well as a process to deal with deviations from the rule. The Pact was a failure with many countries (including Germany) going above the deficit and debt limits. The rules were then rewritten once and just las weekend, during the European summit, there has been a proposal to rewrite them once again. This is what some have referred to as a proposal to create a fiscal union, which is clearly not the case. The proposal is simply about changing the enforcement rules of the Pact. - simple numerical limits are "too simple" to deal with fiscal policy. Applying the same rules to every country and every year makes no sense. And the moment you open the door for exceptions then the rules lose their meaning. - enforcement of the Stability and Growth Pact does not work because the enforcers is the same group as the sinners. The ones imposing fines are the ones who pay for them and collect them. As it has been the case before when many countries are above the limit, fines should be paid by all and collected by all. There is no real sanction here. - but even if fines are applied, what would happen to a country in trouble (Italy today) if the other European countries imposed a fine on the Italian government? That their deficit would be even larger and it would simply make things worse. The decision over the weekend was to improve the enforcement of the Stability and Growth Pact and it tries to address the second issue while it ignores the other two. What is worst is that it might not even addressed that issue. The proposal (to be approved) makes the fines automatic. They can only be overturned if a qualified majority of countries agree to it. This is a marginal change that is unlikely to work if many (more so the large) countries are the ones violating the rules. And the proposal ignores the fundamental problems of the Pact. What is more concerning is that there is still no clarity on the goals of the Pact. The Pact and more so its implementation has always mixed goals such as sustainability with other goals such as coordination of fiscal policy and growth-oriented reforms. But there is no clarity on how these things mix together, and some times they do not. Long-term sustainability is a valid goal, more so given what we are seeing these days. But this does not imply that all countries should have the same fiscal policy all the time. In fact, we want fiscal policy in the short run to be different across countries. Coordination of fiscal policy (understood as one policy stance for all all the time) makes no sense in a monetary union. And here is where we are today: starting with the concern about long-term sustainability we conclude that short-term austerity is the right policy for all European countries. But imposing coordination combined with a short-term focus on what should be a long-term goal will not deliver stability or growth. It will lead to stagnation in the region and instability in some countries as fiscal policy is not allowed to play a proper countercyclical role. It seems that many economists agree that the ECB has to get more involved in dealing with the current crisis in the Euro area. Politicians (at least some of them) disagree. They cite fear of inflation, take moral stance on past recklessness, argue that sinners have to repent and repay, etc. By now, hundreds of articles have been written on the potential damages from the collapse of the euro area, so I am not going to repeat them here. I want to focus on what the ECB can do to stop the self-fulfilling collapse of several European economies. The standard view on ECB is that they have to print money in order to buy bonds of governments in trouble like Greece, Italy, Portugal, etc. But there is another thing that they can do. About 18 months ago, the chief economist of Citigroup, Willem Buiter, wrote an article in which he noted that the ECB can use its future profits to stop the acceleration of these negative dynamics on the bonds market. According to his estimates, the ECB has a “non-inflationary loss absorption capacity of … at least €2.4trn and more likely over €3.4trn.” In other words, the ECB can put credibly on the market a firewall of over €2.4 trillion. 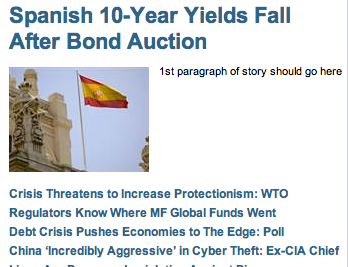 Certainly this ought to stop the ever-increasing yields on Spanish and Italian debt from rising further. How does this work? Central banks run very profitable operations – they issue pieces of paper that we call money on which they pay us no interest. With the printed money they buy interest-bearing securities like government bonds. Because of the interest rate differential between the 0% rate on currency and the yield on bonds, central banks generate profits every year. Well, the actual calculation of the profit (seigniorage) is a bit more complicated (see Buiter’s article), but the mechanics are not changed much. This profit is generated even if inflation is 2% (ECB’s mandate). One way to imagine Buiter’s proposal is the following: Suppose that the ECB issues bonds worth €2.4 trillion (note that they do NOT print money equal to €2.4 trillion). These bonds would most likely have a yield close to the yield on German bonds (2.6% for 30-year bonds) because one can expect that if the euro is alive, the ECB will be mechanically generating this revenue from their activities. After issuing these bonds, the ECB can make an announcement that for countries which are solvent when the yield is 5%, they will not allow these yields to go above 5% (one can adjust the numbers for the state of the cycle, but the idea is that they restrict the yields from increasing due to the lack of confidence). If yields are above 5%, they buy the bonds with the revenue generated through their own issue. If this announcement happens, and if the ECB just starts with some symbolic purchases, yields will go down quite rapidly and yields on Italian debt for example will return to sustainable levels. Notice that if the ECB has to buy the bonds, then they will be generating yet another profit stream from the difference between their 30-year bond (at 2.6%) and the Italian yield (currently at 6.5%). But even if Italy fails and does not repay the bonds bought by the ECB, the ECB can fully absorb the loss. This is why Buiter calls this quantity the “non-inflationary loss-absorbing capacity” of the ECB. Is there any magic or a free lunch here? Not really. The seigniorage of central banks has to be transferred by law to the governments of the euro zone. So, effectively what the ECB does is that it takes future government revenues and puts them today to create a firewall. They can commit to having this revenue in the future because of the nature of their operations. Governments – even though they are the eventual recipients of this flow – cannot commit today because the markets do not trust them anymore. The essential role played by the ECB in this case is to put the certain revenue stream on the table and to tell the markets – this future revenues will be used to absorb losses or to repay debt and not for other spending. It is quite likely that they will never have to buy even one government bond out of this facility. Will the ECB do it? I am somewhat skeptical. It does require a bit of resolve to go beyond the standard thinking. P.S. On November 16, 2011 Willem Buiter also gave an interview on Bloomberg TV where he talks again about this proposal. 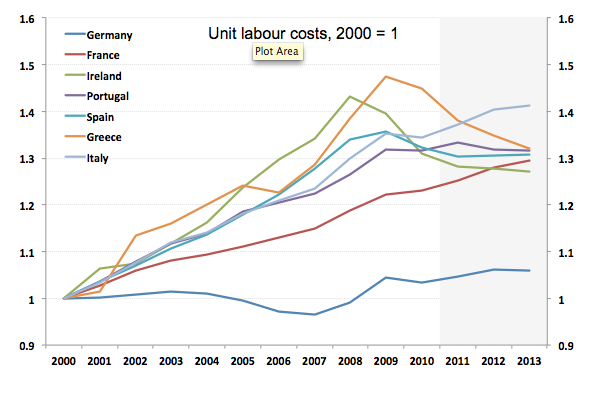 Data is from the OECD and it shows how Greece, Ireland, Italy, Portugal and Spain saw their labor costs increase relative to Germany since the creation of the Euro. This eroded their competitiveness and it is one of the reasons why we find ourselves in a crisis. I wrote last week about how including France in this picture would challenge the conclusion that it is all a problem of the club-med countries (plus Ireland). As I argued there, France looks a lot like all of those countries, Germany is the outlier. There are some differences and the increase in unit labor cost was lower in the Netherlands and France than in the other two countries but the real message is the same as before: Germany is the outlier in this story. So I was now curious to include other countries, those that are not part of the Euro area. Here is what happens if we now include Sweden, the UK and the US. It is becoming very difficult to see which country is which with the exception of Germany! 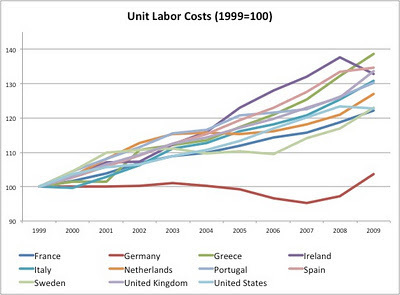 This picture makes it even more evident that the Euro effect on unit labor costs is very much driven by one country. 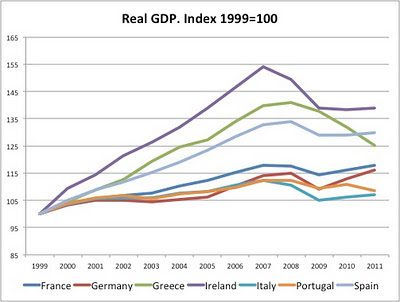 And that comparing Germany to countries outside of the Euro area leads to the same conclusion. The picture above is missing something: it is not correcting for movements in exchange rates, it is just looking at unit labor costs from a domestic perspective (measured in local currency). What happens if we convert the numbers for the US and the UK into Euros? Now the story is very different for the UK and the US. In both cases their exchange rate has depreciated significantly. 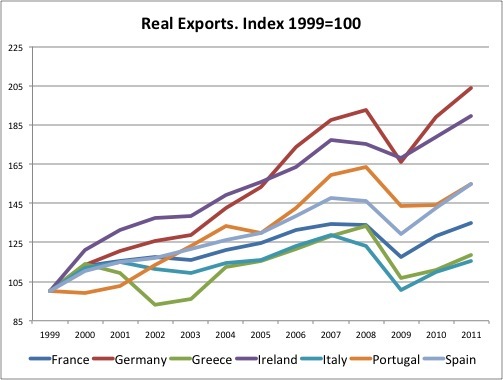 In the case of the US it is a trend that started in 2000 when he Euro reached its minimum (about 83 cents of a dollar). In the case of the UK, the pound retained its value relative to the Euro until the recent crisis when it collapsed. 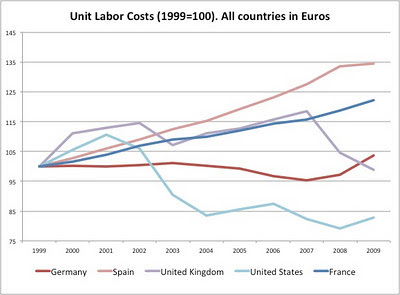 By 2009, and measured in Euros, the unit labor costs of the UK look similar to that of Germany. In the case of the US they look even lower because of the large depreciation of the dollar relative to the Euro since 2000. Let's not forget that despite the fall in the US dollar, the current account of the US still had significant deficits during all those years. 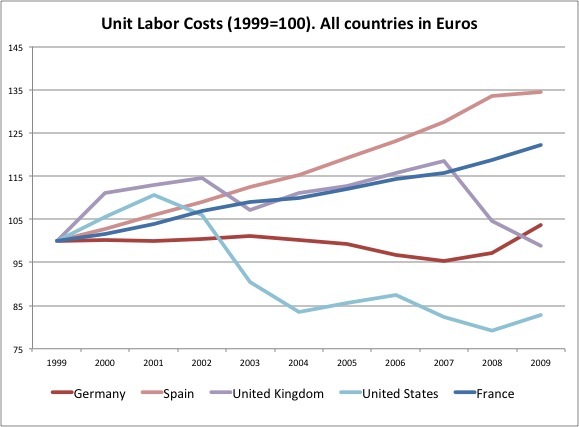 What I learn from this analysis is that from a domestic point of view, ignoring exchange rates, what happened in Germany in terms of labor costs was very unique. 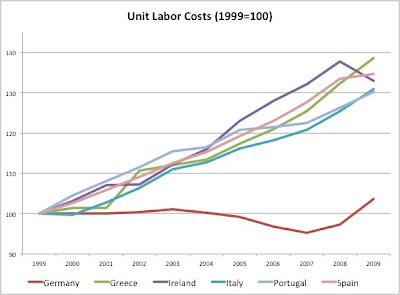 No other country looks like Germany and whether we look at Southern Europe or Northern Europe or we go to the UK or the US we get a similar evolution of labor costs. When you add the exchange rate we find that in the case of the UK and the US, during these years the depreciation of their currencies have made the labor costs fall when measured in foreign currency. How sustainable is this trend is unclear. We have already seen the Euro falling relative to its peak but about 20% which has undone some of what we see in the picture above (the picture above finishes in 2009 when the Euro was higher in value than today). S&P warning or warning about S&P analysis? The fact that S&P is now issuing a warning to all Euro countries regarding their sovereign ratings is not a surprise. All these governments are facing difficulty managing their fiscal policy so there is a potential risk in government bonds, a risk that maybe we have been ignoring for too long. And the behavior of S&P is consistent with their earlier practices: Japan or the US are not AAA in their ratings and they seem to like to make announcements around specific events so that people listen to what they have to say. Sounds good. Too bad that they had to be bailed out by the US government a couple of years later. And S&P was also the same rating agency that was very pleased with fiscal policy in advanced economies during the years when it was really badly run (during the good years when we should have seen s healthy surplus). And do not panic if they downgrade all the Euro government bonds, we still have Liechtenstein rated AAA. 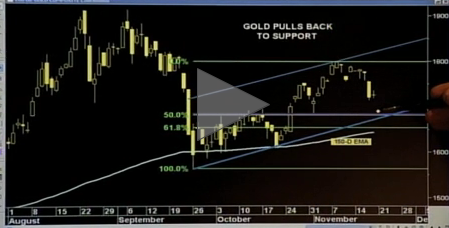 And if you get tired of government bonds you can invest in the gold market. Visit the S&P web site today and right there were they have their announcement on the warnings to Euro governments you can also find a great video explaining how Gold has dropped to a strong support area, picture below for your entertainment - I wondered if they used a similar graphical analysis to calculate the probability that the German government will default on its debt obligations. When countries are members of a single currency are, such as the Euro, they cannot depreciate their currencies to boost their exports. The only way to produce the equivalent of a depreciation is to keep costs growing at a lower rate than other countries. This can only be achieved through wage moderation - not in absolute terms but relative to productivity growth. This is sometimes called an internal devaluation and it is normally thought as being more difficult to achieve than a straight devaluation or depreciation of the currency because it involves changes in wages. Many see this today as a challenge for Souther European countries as they might have been losing competitiveness relative to the other Euro countries and now they cannot just use their exchange rate to gain it back. The recent OECD economic outlook talked about all this and had a chart that I am reprinting below. 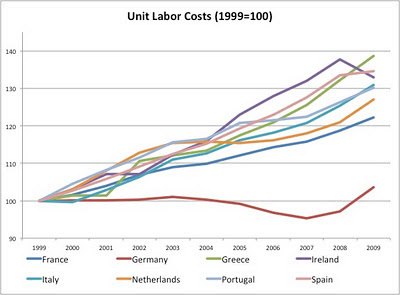 The chart shows unit labor costs of selected Euro countries. The striking pattern of the chart comes from Germany. Germany managed to keep unit labor costs constant while all other countries in the chart saw increasing labor costs since the creation of the Euro. It is important to notice that this is not just about the usual suspects, France looks very similar to all the "club med" Euro countries. What is really remarkable is the behavior of Germany! What I find interesting in this chart is that with the creation of the Euro, Germany managed to "engineer" such an increase in competitiveness while it did not manage to do it when it had its own currency. The German Mark, as any of the other large currencies in the world (the US dollar) fluctuated in directions that might not always have been in the interest of the country. In that sense, one could argue that Germany had a stronger control of its real exchange rate post-1999 than before. Of course we are talking about the intra-Euro exchange rate. Relative to the US, there is still an exchange rate that Germany cannot control: the Euro/Dollar. And this runs contrary to the way we normally think about exchange rates. It is when you control your own currency that we assume that you can better to influence your real exchange rate. Just to complement the chart above, I produced two additional charts with the behavior of exports and GDP (both in real terms) during the same period. There are, of course, many other factors that affect these two variables but it is interesting to check what happened to both during the same years. 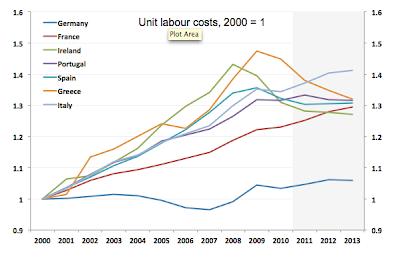 Did Germany benefit from the behavior in unit labor costs? When we look at exports we see that Germany did better than any of the other countries, although the behavior is not as extreme as one would expect from the behavior of unit labor costs. When we look at GDP then Germany is not an outlier at all and in fact it is one of the countries with the lowest performance during these years (only Portugal and Italy performed worse). There are reasons why we do not expect Germany to grow faster than the other countries (Germany has a higher GDP per capita than all of them) so the absolute comparison might be misleading but it still provides a sense on how the behavior of unit labor costs was reflected in economic activity and exports.